Pete Yonkman, president of Cook Group and Cook Medical, spoke to the college’s Presidential Ambassador Corps during the inaugural Presidential Leadership Seminar at Franklin College on Tuesday, Nov. 13. During the seminar, moderated by Franklin College President Thomas J. Minar, Ph.D., Yonkman shared details with the students about his personal career path, the Cook Group, lessons learned from the company founder, Bill Cook, and information about programming, vision and values. He also provided advice regarding leadership development, career growth and maintaining upward mobility in an organization over time. 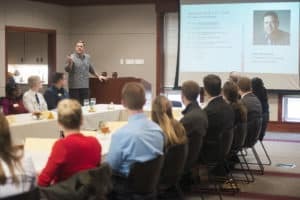 The new seminar series was the vision of President Minar and is designed to expand the leadership skills of the 28 students currently in the Presidential Ambassador Corps, also known as the GrizPAC. The GrizPAC is comprised of the college’s best and brightest leaders, selected through a rigorous application process, who personify the college’s mission and values. The students serve as official student representatives at college and alumni gatherings; are expected to hold themselves to the highest possible standards at all times; and attend events with the college president, both on and off campus, as student ambassadors. Cook Group is an American family-owned company based in Bloomington, primarily involved in the manufacturing of medical devices. Yonkman became the president of Cook Medical in November 2013 and president of Cook Group in July 2015. He joined Cook Group in 2001 as corporate counsel and manager of Cook’s patent office. He has held multiple leadership roles in the organization, including president of Cook Urological, executive vice president of sales and marketing, president of Asian operations of Cook Group, and the executive vice president of strategic business units at Cook Medical. He earned undergraduate degrees in psychology and philosophy at Indiana University in Bloomington as well as a law degree from the Indiana University Maurer School of Law. For more information, please contact the Franklin College Office of Communications at (317) 738-8185.